Sorry for the bit of a hiatus since my last post. There are a few reasons for this which I've detailed below. Nevertheless things are still getting done and I'm very proud of how things are turning out - Rules are really coming along and everything is lining up for blind playtesting - I'm sure that when everything is done and dusted we will have a fantastic looking product with streamlined mechanics that Loyals and Traitors alike will really enjoy. I've been quite unwell as of late. I managed to get sick *twice* with a nasty throat bug since last blog post. I've been feeling better at times... feeling much worse at other times. I think some of this has to do with exercise, but I'm beginning to suspect that it's been mostly diet related. I'll be starting up a food diary and tracking what I eat and how I feel each day to see if I can isolate if it is certain types of food that are the cause. Feeling tired, low energy, bloated, among other things. I don't wanna whine, but it's something I need to work proactively towards. I'll also be trying to cut out as much sugar as I dare to. I'll let you know how I progress and if I notice any major differences - who knows, it might help someone out. Those of you who follow the blog, you'll know that marketing isn't my forte. I'm trying my best to figure out what works and what doesn't. Twitter seems to be *the* number one place for people who are interested in upcoming Kickstarter projects like board games and so forth. I don't actually don't like Twitter for a number of reasons, the main one being that they seem to be quite political, often silencing people wherever possible who disagree with their companies political stance and views. Google and Facebook are just as culpable here. Since I'm a strong proponent for free speech that kinda rubs me the wrong way. Even though I'm not the biggest fan of Twitter, most of my followers seem to be coming from there. As much as I dislike Twitter I will focus my efforts to gaining followers on Twitter and staying in with the followers (other than this blog of course). So please make sure you follow me on Twitter to stay up to date with any major developments. Naturally I will also be echoing out the other important updates over my other social medias listed here. One message I need to remember to push is how Act of Treason is going to be a great game for those who love that social deduction styled games like mafia and werewolf but are looking for even more opportunity and ability to deceive, bluff, persuade. I think that's the strongest part of Act of Treason. 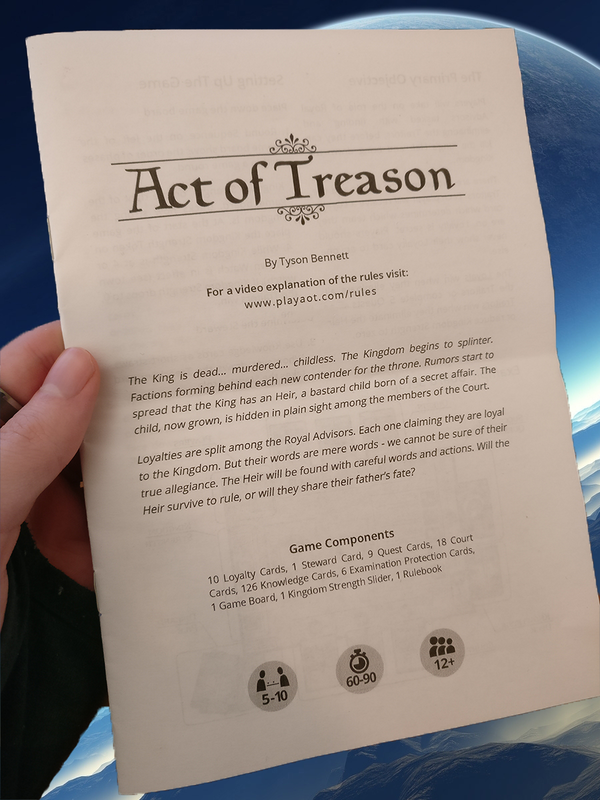 Act of Treason was designed specifically to allow players to flex their social deduction and prowess as much as possible, And that's purely because that's exactly the game I wanted to play! I got tired of playing games like Mafia and Battle Star Galactica where the opportunities for social deduction are limited. Playing Act of Treason is very humbling. Just when you think you've got a handle on how to play well, someone will show you that you can still be fooled and maybe you don't know everything you think you do. It's not an easy thing to fit all this into a soundbite however. "Act of Teason - Betray your friends, Deceive a Kingdom." It's close isn't it? it's certainly the best I've heard so far. I've been fixing up all the assets so that they are as close as they can be to the final product. This helps as the less changes I have to make, the less something will go wrong in the drift from the prototype to the final revision. I always try to follow the adage "Train how you play". I think that is fantastic advice that is applicable in so many parts of life - and definitely applicable here. The Act of Treason Prototype is close to the final product in everything other than the final art. It should just be a matter of 'dragging and dropping' in the new artwork to make the game look as nice as possible. Everything else is already in place. Part of revising the assets involved me getting the Rulebook as close to the final as possible with the layout, diagrams and references in place - this is actually a major task surprisingly, and I don't doubt that blind playtesting will reveal even more changes that I need to fit into the rulebook to help smooth out any sore points. I've just been working on the rulebook all of today, it's surprising how the tiniest of details can help to smooth out the explanation for new players. 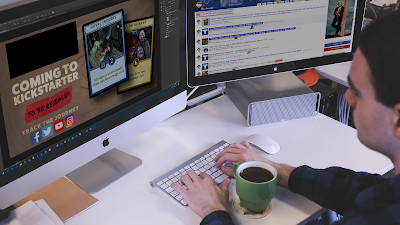 I look forward to having the best rule book possible, as well having the rules online, and in a video, at www.playaot.com. We are getting very close to the Kickstarter. Once I get the Rulebook checked a couple more times by third parties, and I get my prototype from Game Crafter delivered and checked, then I'll be ready for blind playtesting! After that it's third party and then right onto the kickstarter! Very close folks! I can see the horizon and It's looking glorious! I also want to give a shout out to Shem Phillips (@garphillgames on twitter) who I met at Boardgames By The Bay, a local board game convention in my area. He has given me some great advice on how to progress towards the Kickstarter. Feel free to check out the awesome games he has made here. I also found out about the Game Artisans NZ Facebook Group at the same convention, which will be a great resource for me going forwards. I've not forgotten about some of the other topics I promised to cover in previous posts. I'll be doing a big recap over some of them closer to the Kickstarter - or after. It will depend on the topic. But that's plenty for this week.